I'm smiling. :) Why, you ask? Because it's time for one of my favorite memes, As Of Late. I enjoy writing it up - but more, l love reading others' posts and seeing what THEY are up to. Lately, I've been seeing the light at the end of at least SOME of my tunnels. Lately, quiet is not quite as rare, but still just as precious. Lately, I'm adjusting to the fall schedule. Lately, I'm reading in Isaiah, and absolutely LOVING it (as usual). Lately, this book is totally wowing, and teaching, me. Lately, I'm astounded at how fast my kids are growing up. Lately, I'm savoring moments with my husband. So, what's going on with YOU as of late? 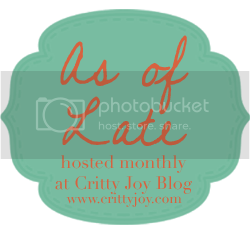 Be sure to stop by Christy's blog and join in - AND read others' "as of lates." Such beautiful things on your list sweet Joanne. Woot for lights at the end of the tunnel. I so understand that tired thing...especially this week. My SIL and I were chatting last night about how fast kids seem to grow... and so glad you are getting some wonderful moments with your husband. Thinking of you constantly, Joanne!